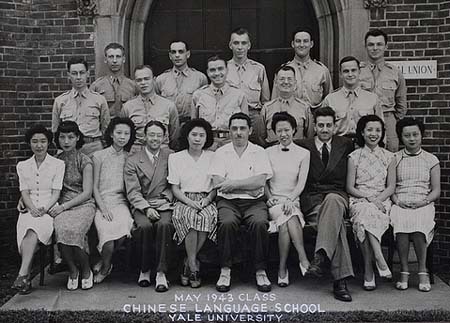 The Chinese Language School at Yale University, established in January of 1943 to provide Chinese-speaking American officers and enlisted men for the U.S. Army, has been reorganized on a permanent basis. One of the two centers in the nation emphasizing spoken Chinese, the school, which is currently training civilians for various posts in China, will henceforth be designated as the Institute of Chinese Language and Literature. During World War II, a total of 418 men, including 176 officers and 242 enlisted men, received instruction at Yale in the Chinese language to equip them to train Chinese troops in all phases of modern warfare. The last group of these men left Yale on Nov. 30, 1945. In 1947 the name changed again to the Institute of Far Eastern Languages. George Alexander Kennedy was Professor of Chinese at Yale University from 1938-1960. He was also director of the Military Intelligence School and Army Specialized Training Program in Chinese at Yale from 1942-1944. During World War II, the campus was largely given over to the military, and over 20,000 soldiers, sailors and marines were trained on campus at Yale through the Army Specialized Training Program. The Army undergraduate courses included engineering, premedical, and language study and the advanced work consisted of medical training, a Military Intelligence School, and a Civil Affairs Specialist Training School. In this picture from 1943, Kennedy is sitting front row center, with the staff on both sides and with the students at the top. In the row to his left is Yale graduate and Young China Hand John De Francis, who would later go on to develop a notable series of Chinese language teaching materials of his own, followed by a major dictionary of modern Chinese. The program thus had long effects, beyond the emergency that had called it into being. Beginning in 1951, IFEL's primary mission was to provide the US Air Force Security Service with airmen trained in Asian languages, chiefly Chinese and Korean. The director of the Institute from 1952 through 1962 was Henry Courtenay Fenn. This arrangement ended with IFEL’s last classes in 1965. In September, 2012, Robert Bonds and Henry Kwan of the Yale Alumni Association arranged with Thomas Opladen, Yale Veterans Association President, to host a 50th anniversary event for the 1962 classes at IFEL. Colonel Scott Manning, commander of the new USAF R.O.T.C. detachment 009, accepted a gift plaque from the IFEL62 members to be installed at 215 Park St. to mark the original location of IFEL. In March, 2013, Tom Opladen, with Robert Bonds and Henry Kwan, arranged for former IFEL students to be able to join the Yale Veterans Association. In April, 2013, Colonel Manning invited former IFEL students to attend Yale's first annual joint Air Force and Naval ROTC awards ceremony. On September 25, 2013, Robert Bonds and Henry Kwan along with Tom Opladen hosted a group of IFEL students from the 1950s and 1960s for the unveiling and dedication of the plaque at 215 Park St. In the early 2013 run-up to the first annual Joint Air Force & Naval ROTC Awards Ceremony, Colonel Scott Manning mentioned to a few IFEL62 grads that it would be possible— in fact desirable— to create an award of our own to honor today’s ROTC cadets and at the same time solidify the historical presence of IFEL at Yale. There was widespread sentiment among IFEL grads for recognizing the importance of Bob Tharp to our IFEL educations and in some cases to future careers, so the new honor was named the Robert N. Tharp Award. Click here for a detailed account of the award and photographs of the recipients until today.